For many people, student loans are the most achievable way to finance your college education when you add them to your savings. These loans can come in several different types, and they have different qualifying and repayment aspects. Students and parents can receive college loans from the federal government, state governments, colleges and private organizations. No matter which type of student loan you get, they are different from grants and scholarships because they all have to be paid back and they all accrue interest over time on the initial amount borrowed. Federal loans are generally the most secure type of loans, and usually have the lowest interest rates. Some government loans are need-based, and are offered to students based on their FAFSA information. Federal Perkins Loans are awarded by colleges to students with the highest need. Federal Direct Subsidized Loans have a borrowing limit that increases for each year of school you complete. Federal Direct Unsubsidized Loans allow you to delay the interest fees on the amount you borrowed until after graduation. However, not paying interest fees at first means you’ll actually end up owing more in the long run. Federal Parent PLUS Loans allow parents to borrow in order to cover the total cost of college, minus any financial aid received. In general, private loans are not subsidized or need-based. These loans often require a parent to commit to repay the money, as a co-signer on the loan, if the student fails at repayment. These are provided by banks and other financial institutions, so private loans usually have the highest interest rates. That means that it’s best to get as many federal loans as possible before turning to private loans. This special type of loan means the government pays the interest on the loan while you are enrolled in school. Once you are no longer enrolled, the loan will start accruing interest, which you will be responsible for paying on top of your original loan amount. Unsubsidized loans are traditional loans that begin accumulating interest as soon as you begin receiving them. You will be responsible for paying the original loan amount, as well as the loan interest that accumulates while you are in school. HOW SHOULD I REPAY MY STUDENT LOANS? If you’ve borrowed money for college, it’s important to repay responsibly. If you have federal loans, there are programs in place to help you if you are unemployed or can only make low monthly payments. Learn more about these programs from the office of Federal Student Aid. Start early. 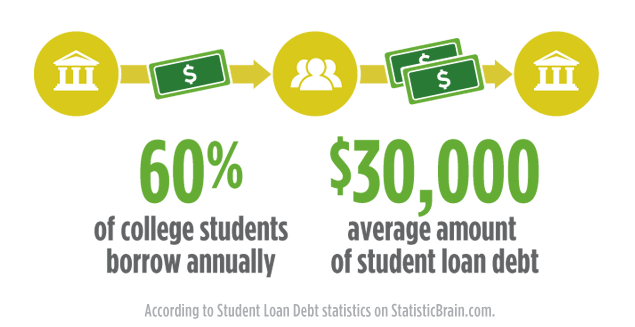 If you’re able to pay off interest while you’re still in college, you’ll save money over the long run. Remember, your loan repayments will consist of principal (the original amount you borrowed), plus interest. The longer you take to pay back your loans, the more you’ll pay in interest. Calculate your payment. Find the loan repayment plan that works for you, before the bill arrives. Use the loan calculators from FinAid.org. If you have federal loans, explore your repayment options, including loan consolidations or deferment. Keep your lender informed of any changes in your name, address, email address, phone number, Social Security Number or school enrollment status. Make loan payments regularly, even if you don’t receive a bill or repayment notice. Billing statements are sent to you as a convenience, but you have to make payments even if you don’t receive any reminders. Don’t default. The consequences for failing to pay back your loan can be severe and long lasting. Your credit rating could be damaged, and you might not be able to take out loans for future expenses — such as a car or mortgage — or receive your federal income tax refund (which will be applied to your loan balance instead). Ask for help. Repayment options are available to assist you if you’re having trouble making your loan payments. Your lender is more likely to be flexible if you are proactive about seeking help. Start saving early with an Indiana CollegeChoice 529 Direct Savings Plan.